Kick off your flip flops, sink your toes in the sand, and crack open a cold beverage because summer is here! And what better to celebrate than by throwing a beach party? Fun, sun, food, family, and friends. How could you not have a blast? 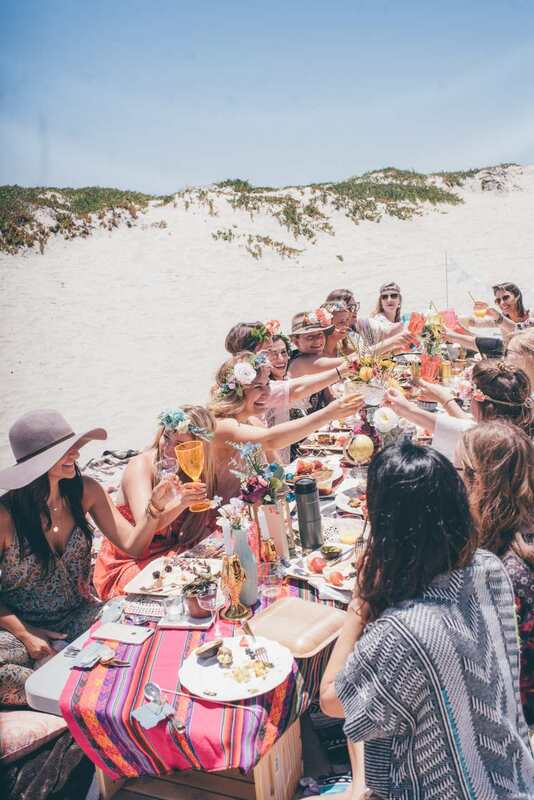 Beach parties can be as elaborate or as low-key as you like, making it a great budget-friendly option. When it comes to summer soirees, we’re fans of tropical or beach themes. The fact that you’ve already secured a seaside setting puts you a step ahead. Break out the pineapples, tiki torches, and grass skirts for a Hawaiian Luau. Transport guests to the Caribbean with bright hues, palm tree decor, and the sounds of steel drums (making a playlist is budget-friendly alternative to hiring professional musicians). Or, go full-on Americana with a boardwalk-inspired fête, featuring checkered napkins, burgers, hot dogs, and seasonal pies. For safety reasons, most beaches don’t allow you to bring glass. The solution? Disposable plates, bowls, cups, utensils, napkins, and straws. You can find plenty of options online, like the cute wooden spoons pictured here, from SucreShop. You can even find biodegradable, recyclable options—great for your party and the planet. Plus, being able to toss supplies will make clean-up a cinch. Ocean breezes are delightful...that is until your paper decorations blow away. When you’re planning a beachside soiree, consider the practicality of your accoutrements. What’s awesome is that you’ll find a ton of inspiration—and supplies—all around you, which will help curb costs. Afterall, shells, sea glass, rocks, and driftwood are free. Most people come to a party ready to eat. So, you’ll want to have some little nibbles and appetizers ready for folks who are feeling a little peckish. You can’t go wrong with finger foods like Vietnamese summer rolls, bruschetta (tomatoes are at their peak in the summer), and crudite with dip. And who doesn’t love chips and guacamole? Looking for a fun way to get guests involved and turn eating into an interactive experience? Try a build-your-own food bar. Bonus: It’s ideal for pleasing picky palates. Hot dogs are a classic summer classic. Grill franks to perfection and let party-goers pile on their favorite garnishes and condiments. A do-it-yourself food station also works really well for sliders and tacos! On a budget? Opt for a "you bring it, we grill it” potluck. Complement your mains with scrumptious sides. Prep-ahead side dishes like potato salad and watermelon and feta salad will make your hosting a heck of a lot easier. Since you’ll already be firing up the grill for your mains, adding corn and veggie skewers to the menu is a no-brainer. And, of course, you can’t eat burgers and dogs without chips. On a hot summer day, there’s nothing better than a cold beer. Fresh and fruity white wine sangria is another seasonal staple. If you’re feasting on Mexican fare, a pitcher (or two) or margaritas is a must. On the non-alcoholic front, be sure to fill coolers with plenty of bottled water. A jug of berry-infused H20 is effortless but looks extra fancy. Pro tip: Stock up on ice! You can always toss the extra in the freezer and use it later in the season. Craving something sweet? S’mores are the epitome of summer. Get creative by adding strawberries, bananas, and caramel into the mix. An ice cream sundae bar with all the tasting toppings and specialty cones is a guaranteed crowd pleaser. And who could resist mini key lime pie cups? The difference between a good and great bash? Entertainment. Turn up the tunes and start a limbo contest or conga line. Planning an adults-only party? Bust out red plastic cups for beer pong. A bonfire will keep the gathering going well after the sun goes down. Plus, it’s essential for making ooey gooey s’mores. Just keep in mind you may need to obtain a permit. Not all guests want to spend the days in the sun, which means they’ll be seeking shade. And if you don’t have any, there’s a chance they might leave. Prevent that by setting up some colorful umbrellas. Similarly, don’t forget to pack SPF. Bug repellent isn’t a bad idea either. Pack enough for the group. We promise, your pals will thank you.